The SonicDry Fly is our premium wader and features 37.5(TM) technology, an active particle permanently embedded in the fabric to capture and release moisture, drying up to five times faster than similar fabrics, diminishing wet cling and keeping you more comfortable. A bunch of at Red's wear these, and all agree they are a GREAT product because when you put them on you can't really see the fruity little stirrups on the bottom. You can go to the store, bar, gas station, or whatever without feeling like you are wearing a leotard of some sort out of aerobics class. These are quality fleece and the inside of the pockets are a nice mico-fiber. Redington got it right with these. The I/O Fleece pant is the good ol' boys answer to insulation. Made from 280g non-pilling fleece, these pants offer a fully elastic waist, full zip fly, and on-seam side pockets. 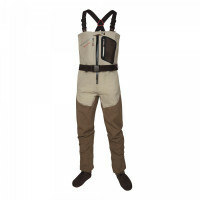 Lycra stirrups keep pant legs down in your waders for added comfort.